We’ve previously covered Geocaching in our list of #52Things to do before you turn 16 (see our Geocaching blog here). If you are familiar with Geocaching you’ll soon see similarities with having to find things, but that’s where the similarity ends. The downside to Geocaching is that you are dependent on a device, which doesn’t help with learning how to map read. Orienteering relies on your navigation skills to travel between different points on a map, called control points. Orienteering is traditionally on foot. There are many competitions where runners race between the control points. There are lots of other forms of orienteering too, such as car orienteering, ski orienteering, horse orienteering… and just about any mode of transport where you can navigate between different points. A course is created with a number of control points. Each control has a number or letter. You are given a control description sheet that tells you which controls you must visit and in which order, and may contain information about where to find the control. As you navigate around the course you record your visit to each control. In an organised event, you may have to use a special ‘punch’ at each control, marking your control sheet as you go around. Though many events now use electronic devices to record your visit at each control point. For a permanent orienteering course, such as the ones provided free at some National Trust locations, you record the letters you find at each of the control points. Don’t worry. It’s a lot easier than it sounds! Official orienteering maps are slightly different to Ordinance Survey Maps but very similar. 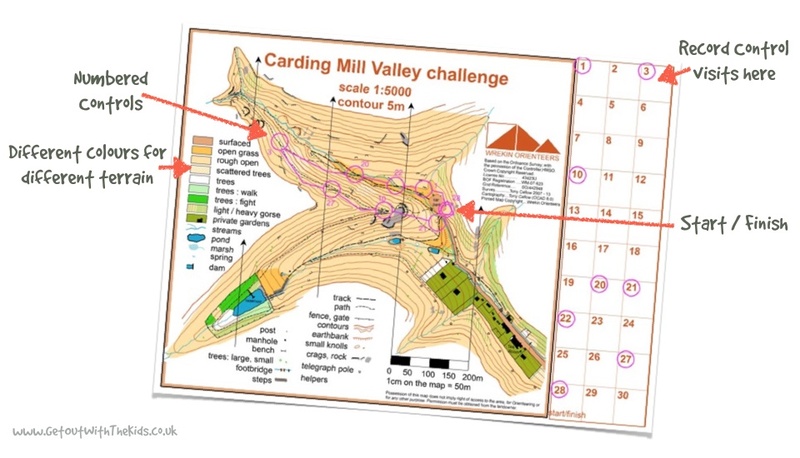 Below is an example of an Orienteering Map available from the National Trust.